Took this picture a couple of years ago in Barstow CA, which is the inspiration of this month’s flower. This poisonous, but lovely flowering bush is very common here in Southern California. As a small child, I remember my mother telling me to not pick the flowers, even though they were pretty because touching the plant could make me sick. 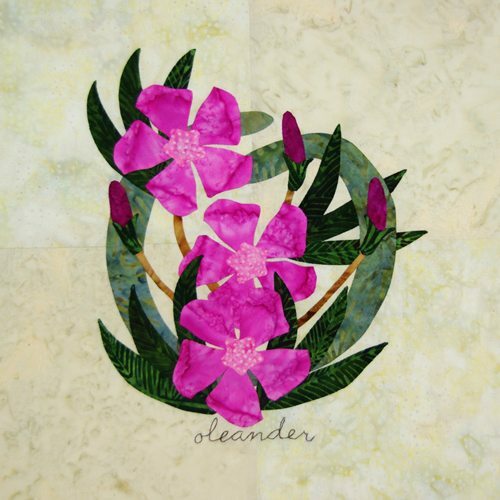 It begins with “O” so oleander is the flower for February! It does have some small parts, but I couldn’t design it without the buds and the star center. 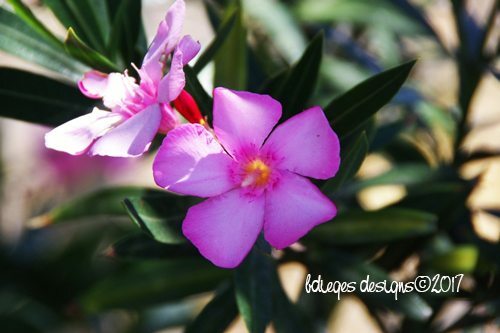 Do you see that tiny star in the center of the flower in the photo? That is why I made the center a star. I am annoyed with myself that I didn’t think about the values of the two overlapping flowers, so keep that in mind for your block. I should have made the flower in front slightly lighter and if you remember the fabric I showed you, that could have been easily accomplished. However, once I had the petals cut out and basted in place, I was not about to start over! 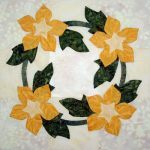 I also ended up using a different fabric for the centers because I had put away the petal fabric before realizing it was needed for the centers. When I put my hand on that speckled fabric I thought it was a better choice. 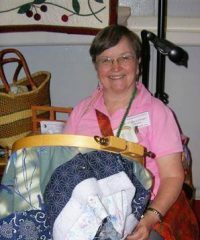 That is what is great about having a fabric stash. 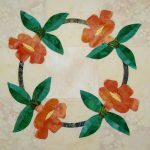 As an appliquér, when you look at fabric, don’t just look at the overall pattern or design. Look at what can be done with small areas of the fabric. Flower centers, bird’s eyes, leaves, petals, feathers, etc. You don’t need to build your stash all at once and you don’t need to buy large amounts. Appliqué motifs do not require large pieces of fabric. Here and there when you see this kind of fabric, buy just a 1/4 yard or Fat Quarter, even a Fat Eighth. My stash is very large but very useful! I think the following Chinese fortune cookie fortune is perfect for a quilter and says it all! Just got it on Sunday. It gave us all a big laugh. 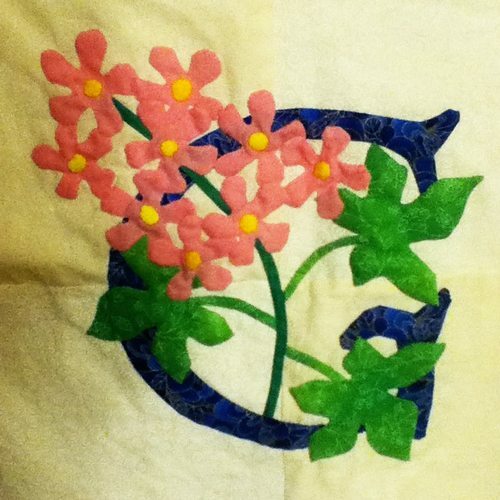 Rachel P. shared her G block for Geranium on the Celebrating Hand Appliqué Facebook group, so I thought I would share it here with those who are not on Facebook. If you are on Facebook you can join the group just by asking. She said she altered the flowers to make the appliqué easier and I told her that it is her block and these blocks are supposed to all be similar, but not necessarily identical! There is a change in the way you get to the link with this post and all subsequent posts. Click on the title “2017 Alphabet Block of the Month” below to take you to the page with all of the months. This is definitely a “star” flower. Thanks. I am seeing some possibilities here. Thank you, glad you are all liking this block. Onto the P block! What a beautiful block. thanks so much. I love this series of Floral Letters. 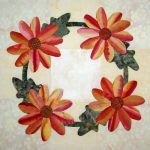 I love to do applique so these will do great on my projects. c Thanks and keep up the great work. Merci, encore une trés joli bloc! Thank you, still a very nice block! Thank you very much. Here it is a lovely sunny day.